How, you may ask, are New Games relevant now? Aren’t they from the touchy feely times? Aren’t they in fact now Old Games? From the way I see it, they are even more important now than when they started. New Games are not only a model of cooperation of how we can play together, but show how we can live together. With the challenges facing us today and in the future, I believe it is imperative that we learn how to work together to save the planet and, ultimately, ourselves from disaster. 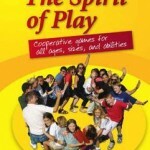 Cooperative New Games are one great way to learn how to be together considerately. The place to start is with the family. It is the bedrock upon which a society and a world are built. Family members are getting more and more segregated into separate individual activities, whether it’s work, school or recreation. TV, computers, and iPods, while marvelous, have caused us to become isolated from one another. Time and time again I see people walking along, absorbed in their phone conversation, not really present in the place they’re traversing. Or they’re got their ear buds in listening to something on their MP3 player. In any case, people seem more than ever to isolate themselves from each other. I believe this makes it hard to relate to each other because we don’t get much practice doing it. Rare are those times when the whole family is together. 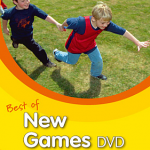 What New Games does is bring all ages together to have fun, bring out their creative side, and see each other in a new light. It gives a family a chance to have a joyful time together, where everybody can be a part of what’s happening. Even children under the age of 5 can join. If they are not able to understand completely what’s going on or are physically challenged, they can partner with a parent or sibling. This especially important in active games. They are usually thrilled simply to be a part of what the bigger people are doing. In playing together, we find good, positive ways to relate to each other. Of course most of this applies to our friends as well. For many of us, they have become our family. In any case, this is why I see New Games as relevant in the twenty first century. Don’t take my word for it, try it for yourself! For three free games descriptions with videos, sign up for our newsletter on the right and get our “New Games Starter Kit.” Or order one of the books or DVDs under the Products section. It was fun to see some of the reserved and competitive students loosen up and cooperate with other students who they normally do not associate with.